This week’s blog comes to you from Vienna where the 24th European Congress of Radiology opened on Thursday 1 March. The conference theme is “Innovation within Tradition” which was exemplified by the Opening Lecture, delivered by eminent art historian, Dr Sylvia Ferino-Pagden. 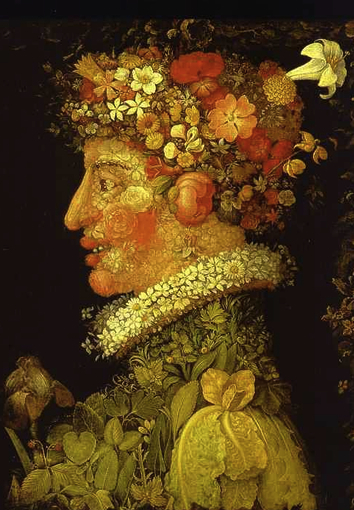 She spoke about Giuseppe Arcimboldo, a 16th century artist whose colourful drawings were used for scientific illustrations during the late Renaissance. The conference logo (seen at right) is based on a painting entitled Spring. One of the first sessions focused on new technologies for imaging the breast. Marco Stampanoni from Zürich presented a paper on differential phase contrast mammography in which an interferometer was used with a standard X-ray source to induce refraction and small-angle scattering. These signals, normally considered as “noise” enabled him to discern the difference between malignant and pre-malignant changes in mastectomy specimens. Florian Engelken from Berlin used digital breast tomosynthesis, combined with a range of compression forces, to measure elasticity of breast tissue. Since malignant tumours are much stiffer than benign fluid-filled lesions, this novel elastography technique has potential. HAMAM is an EU-funded consortium that has been concentrating on automatic alignment of multi-modal images of the breast. Since there are a plethora of breast imaging modalities – such as X-ray mammography, magnetic resonance imaging, 3D ultrasound, digital breast tomosynthesis, and positron emission mammography – the radiologist faces a considerable challenge when integrating all the information to make the optimum diagnosis. This is where the power of the modern digital computer can be harnessed. David Hawkes and his team at University College London have developed algorithms for aligning the images even when the breast, which is a very mobile structure, is in different degrees of compression. By creating a finite element biomechanical model of the breast, they can simulate the compression and automatically project the structures in one modality (such as MRI) onto another (mammography). Nico Karssemeijer in Nijmegen has been exploring the potential of computer-assisted diagnosis (CAD) when there are multiple modalities. He concluded that CAD could be more effective if it were implemented differently: the radiologist first identifies an area on the image that looks suspicious and the computer then tells him or her the likelihood that the area is malignant. However, as someone in the audience observed, “You can build the most exquisite machines but you will not have made a contribution unless the woman shows up for an exam”.